Cascades Trail and recreation area in Pembroke, Virginia is a little over 20 miles northwest of Blacksburg. Drive on US 460W for 13 miles, take a right turn onto SR 623/Cascade Drive, and drive for four miles to the parking lot. Primary activities included hiking, fishing, and leashed dog walking but camping was not allowed. Parking cost $3/vehicle and was abundant; although, we have been there when cars were overflowing into the street. Water, picnic tables, and really nice restrooms were provided. Cell phone service strength was moderate while in the park. The following Google Map shows estimated GPS coordinates for both the lower and upper trails. Zoom in and click the markers to see pictures of the two bridges and waterfall. Hiking to the Cascades waterfall was over 2 miles so out and back was almost 5 miles. The trail started at 2,200 feet and the waterfall was around 2,800 feet. 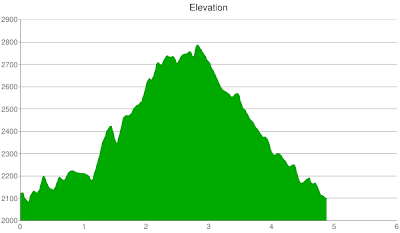 The following is an elevation chart for the entire loop. It illustrates the 600 foot ascent to the waterfall. There are two trails that lead to the waterfall: the lower trail and upper trail. Both trails share the initial tenth of a mile, which was wide and smooth. We made a loop by hiking on the lower trail to the waterfall and returning on the upper trail. We took a right onto the first bridge to head up the lower trail. The lower trail was very rocky in some areas and included rock steps in others and, thus, it was slow hiking. In addition, it hugged the shoreline of the Little Stony Creek. On hot days, the creek has provided us with cool, moist air that took the edge off of the heat and humidity. When we crossed the second bridge, it meant we had reached the half way point to the waterfall. We have hiked this twice, once when our daughter was three and again when she was four. When she was three she sat in a Kelty child carrier for most of the way because the rocks made it difficult for her. When she was four, we only needed to carry her on the last segment because it was the steepest. The rocks near the creek have been wet and slippery, especially after a rainfall. On both of our visits, the Little Stony Creek was flowing strongly and generated a peaceful white noise that blocked out sounds from other hikers. After crossing the last bridge (seen in the following picture and not marked on the trail map), the last quarter mile to the waterfall was a steady ascent. The first fishermen we saw was on this last stretch. A sign near the trail states that fishermen must use single hook artificial lures, release all trout under nine inches, and take home six or less. The base of the 66 foot waterfall included a shoreline that supported lots of people relaxing and picnicking. The next picture was taken on our second visit and after weeks of steady rain. The waterfall had a stronger flow and some of the trail near the base had been washed out. The following video was recorded during our first visit and shows people walking in shallow water to the right of the waterfall. We saw a lady slip and take a pretty bad fall. Although she appeared uninjured, it was a reminder that rocks under water can be extremely slippery. The next video was taken on our second visit and with a better camera. In addition to the shoreline, there was a wooden platform that was eye level with the top of the waterfall and which provided a nice view of the gorge. The subsequent video was shot from the wooden platform on our first visit. The upper trail was wide and smooth and, thus, we hiked it significantly faster than the lower trail. It can be hiked in both directions to shorten a trip, be used for trail running, and/or to make it easier for kids. A drawback of the upper trail was that it was father away from Little Stony Creek. As a result, it was less scenic and the temperature was considerably warmer. The segment shown below was one of only a few that included a view of the creek. The hike ended where it began, which was in a beautiful mature forest with ground cover plants and tall trees. Notably missing were mid-sized shrubs and trees which were likely absent as a result of intense foraging by deer. Forests with a greater diversity in structure, support and are home to a more diverse set of wildlife. The lack of mid-sized plant species means that some species of birds (migratory or year-round residents), insects, and mammals are unable to find habitat. In sum, we have thoroughly enjoyed our excursions to the Cascades waterfall. Hiking along the Little Stony Creek was fun because of its cool air, pleasant sounds, and meandering trail. Other similar trails in the area include Kelly Knob Overlook, Pandapas Pond in Blacksburg, and War Spur Trail in Mountain Lake. Thanks for the comment. That is a funny coincidence. Cascades is fantastic hiking trail. I hope your parents enjoyed it. My husband and I are going up Monday to stay for a few months as Forest Service Volunteer caretakers at this site. Thanks for the pictures and the informative blogging. You're welcome. Thank you for your comment and thanks for volunteering at Cascades! Sounds like a fun summer for you. What kinds of projects do volunteer caretakers do? I hiked this trail a few times with my children many years ago when they were under 6 years old. The improvements have been significant, and it is as beautiful as ever. The waterfall and lake are phenomenal. My daughter and our family are looking forward to a trip there within a few weeks. This time, we will be bringing grandchildren. I will always love and remember the Cascades. Thank you for sharing. My dad is getting a bit up in the years and has a a pretty bad knee, do you think someone like him could do the high trail. Steps are really hard for him. Thanks. Derek, the upper trail would be a 4+ mile round trip plus 600 feet in elevation gain. He may have fun giving it a try with the assumption that he might not make it to the waterfall. The first part of the upper trail is fun because it is near the creek but the second half is steeper and more rigorous and, thus, may be too much for him. Thank you for taking the time to post pictures of the various trails. My oldest is starting VT in the fall and I was looking for activities for my younger ones when we visit the area. The pictures of the trail conditions are better than a thousand words. The parking availability is also very helpful since while going to school in Harrisonburg we would drive to a place only to find no where to park. Great info! Thanks for sharing! I’m planning on making a trip to the Cascades in early January! Should be cold, but fun! I’m a photographer so I’m excited to see the falls and hopefully capture some awesome photo’s!!! Thank you for this post and the comments. My American Nature Writers class from Ferrum College hiked the Cascades trail in our May Experiential Term and enjoyed it quite a lot. I plan to take my sons in the next couple of weeks. Thanks for the pictures and the informative blogging.